The southern Macedonian town of Gevgelija has been synonymous with gambling for the past few years. 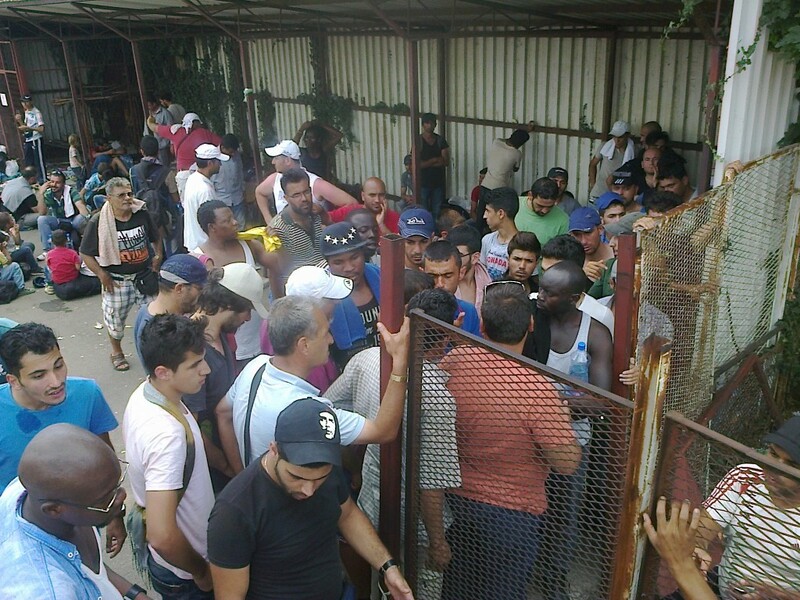 But gamblers’ paradise turned into hell for hundreds of thousands of refugees and Macedonian policemen. Early morning, 4 o’clock. The train station in Gevgelija like a beehive. Migrants and refugees who want to reach their El Dorado, Germany via Macedonia, awaiting transport to the promised land. Mutual anxieties and squabbles stop when the blue train of Macedonian railways appeared, which was supposed to transport them to Tabanovce. Police secures the access to the train and migrants impatiently wait to board it. Most of them are without tickets. 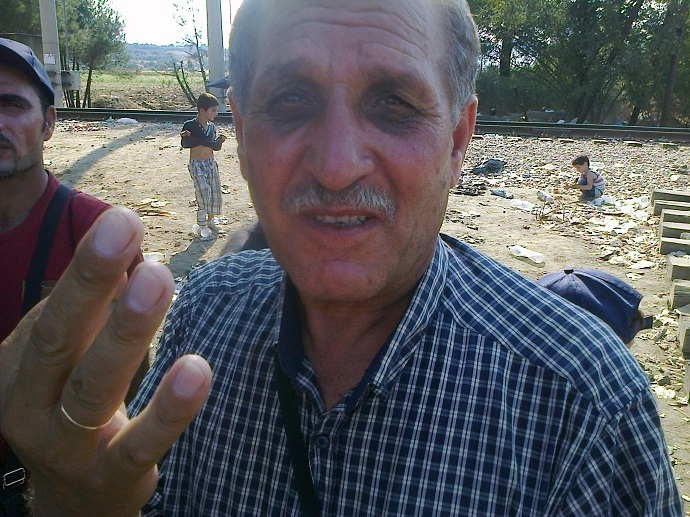 Abdullah from Syria sent his son in front of the desk of Macedonian Railways to get 14 tickets. Just as the train had arrived refugees rushed through doors, windows, they used the space between the carriages if they could. More than half of the migrants do not have any documents to stay in the country. In the hands they hold only one sheet of paper with their photo on it. The document is written in Greek. 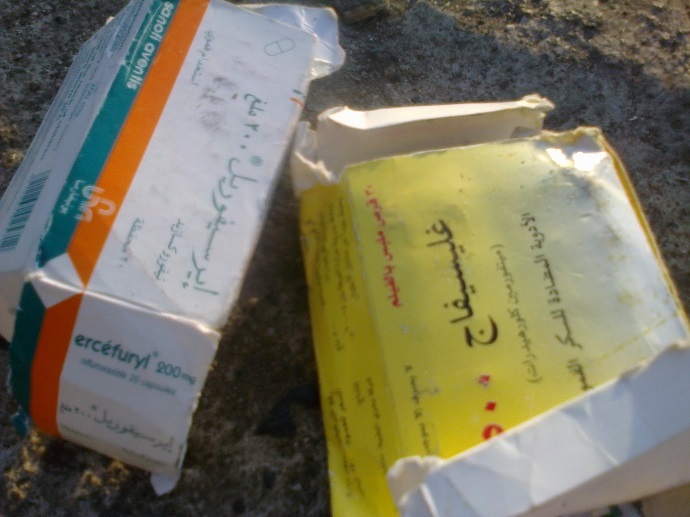 18-year-old Mersiha, a student at the Faculty of Economics in Baghdad, had been waiting for it for 20 days in Greece. “On the island of Kos (Greece) I arrived with my mother, father, two brothers, my sister, my brother-in-law and their 6-month-old baby. Greek police issued documents for a stay very slowly”, says Mersiha. Her father allowed us neither to take a picture of her, nor to publish any video with her. Mersiha’s family was lucky to board the train, but her brother-in-law with the little baby did not board it. With the intervention of the police and a representative of the International Red Cross, they boarded the train, too. The train left for Tabanovce. The refugees who boarded the train happily praised Macedonia. I was also happy with them as well as my colleagues from Sweden, who filmed a documentary with refugees. Finally, after 10 hours of resentment and anxieties, our migrants left. The girl left a strong impression on my three colleagues from Scandinavia. Emotions were mixed. On one hand they were sorry they parted from Mersiha’s family, on the other hand they were happy that Mersiha was travelling to Germany. The railway station in Gevgelija was suddenly empty. Just stink and scattered trash everywhere was left on the crowded platforms with refugees. We were driving about a kilometer to the border and we came across a Kurdish family from Syria with their elderly mother in a wheelchair. They were pushing the wheelchair as the woman was tired and could not walk. We got off the car and one of our colleagues gave a ride to the elderly lady and her grandchildren to the train station. In 20 minutes they returned and we continued to the border. And there an even more dramatic picture. About 10 lightly armed policemen, some of them only with batons, holding around 1,500 refugees not to enter the country. Across the border, 200 meters away, Greek authorities sending two white buses filled with refugees. Buses then returned for new refugees from Thessaloniki. 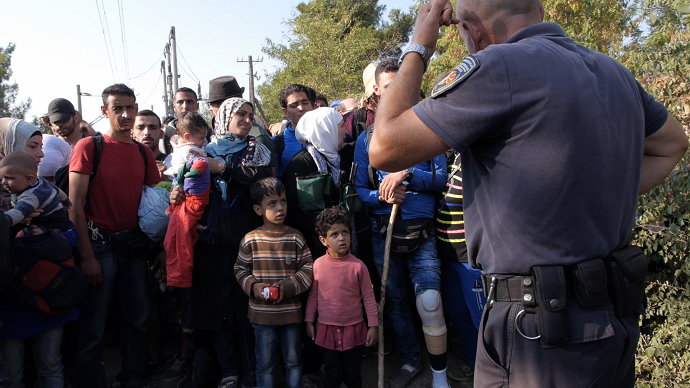 More than 150 people were coming to Macedonia. The tension grew. When refugees saw that we approached with video cameras, they became braver. 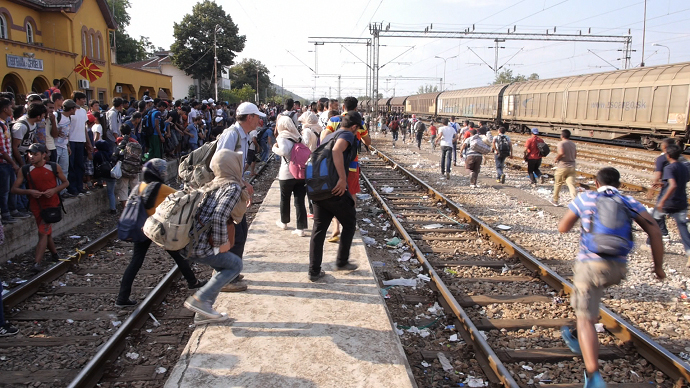 They suddenly pushed the officers and a group of 30 migrants went to the railway station in Gevgelija. A young boy, about 20 years old, who migrants pointed at 10 minutes ago, nearly collapsing, was running on the tracks to get away from the group and quickly reach the railway station. The ultimate goal, Germany, became closer to him, he gained strength and the words that he could not manage and that he would collapse were no longer important. The railway station in Gevgelija was calm for only a few hours, there was no fuss. Only resellers of fruit, juice, cigarettes, water, cards for mobile phones remained. A child was crying out loud. It was heard across the railway station. She was addressing the border police officer in Arabic. The policeman asked her what the matter was. She did not know how to explain. The entire drama lasted 10 minutes. An activist of the Red Cross came, of. A Macedonian of Arab origin who seemingly spoke Arabic well. He talked to her and was astounded. He explained to the officer that the girl woke up to see that her parents and her group had gone. They left with the train to Tabanovce while she was sleeping. The child’s cries poked the heart of those present at the railway station. They quickly organized and the girl left Gevgelija with a Red Cross vehicle. The case of the lost girl was widely commented among refugees. Grouped in 15 people, and only one goes to get some valuable information, such as when the next train to Tabanovce arrives or when they would receive documents from the police to legally go to Serbia. In the group, with his mother, we also met 13-year-old Irfan. He is the head of the family. His 56-year-old mother and his two older sisters are with him. “We want to leave Syria and go to the western countries. We have a half sister in Sweden and we are going there. My father stayed in Syria. He is a professor of history of Islam at the University of Aleppo”, said Irfan. His mother was upset by the incident of the 12-year-old girl. She did not let him go away and queue for obtaining refugee status in Macedonia. She did not want her children to segregate, afraid of losing them. “I am from the Kurdish minority in Syria and I am a professor of English in high school. There is a war in Syria. It is too risky to stay there. On one side are the forces of Bashar al-Assad and on the other the terrorists of the Islamic state”, says 56-year-old Zeynep, Irfan’s mother. While talking to Zeynep, we heard the train horn. The migrants got upset. There was fuss and chase, who to be first on the platform. But soon they said the horn was a locomotive pulling cargo composition to Thessaloniki. Passions calmed down. The group of these refugees left the following night at 2 o’clock. Macedonian Railways sent a special train for refugees, that took everyone from the station and they went to Tabanovce. The next morning at around 7 o’clock we were again at the railway station in Gevgelija. The picture was the same as the day before. “For three years it has been like this every day. It is hard for them, but it is hard for us, too. 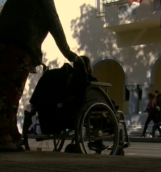 Rubbish is collected and platforms are cleaned with water, however, it stinks too much”, says 70-year-old resident of the block of flats above the railway station in Gevgelija. We left the station and went to the border point again. Around 200 refugees were waiting to enter the country that morning. There was a middle-aged teacher of English literature, Ahmed Kelani. He arrived here with his wife, two older and two younger children. “We want to go to Germany, the Netherlands or Norway. We will look for a new life there. We cannot live in Syria any longer. I sold the house, the car, everything”, Kelani said. His friend Mustafa was with him. He worked as a lawyer in the city of Kobane. “I am 60 and this is perhaps the most important mission in my life. To take the family out of Syria. I am a Kurd and I think in Western Europe there are many Kurds. I hope that my children will manage well there. We cannot live in Syria any longer”, said 60-year-old Mustafa. For about half an hour a larger group was formed and the police let them enter Macedonia. Mustafa and Ahmed’s families arrived within an hour from the border stone to the train station. Ahmed reported his family to the police station and in about 3 hours he received documents to stay in the country within three days. 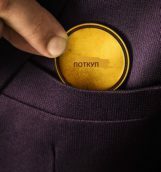 He began to negotiate with local taxi drivers to transport his family to Tabanovce. 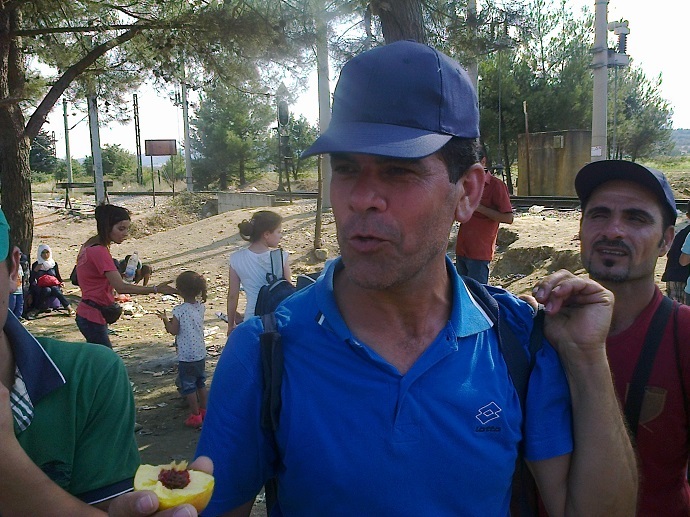 The first thing taxi drivers from Gevgelija yellow cars asked for was his papers. When they saw that he was legally there they said they could agree. “We must not take passengers without documents. 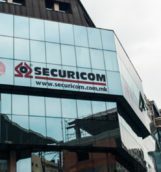 Penalties are several thousand Euros, seizure of the vehicle and imprisonment”, said 43-year-old man from Gevgelija, owner of a taxi vehicle who wanted to stay anonymous. 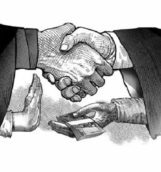 Ahmed managed to bargain with two taxi drivers for 200 Euros to take his six family members to the border crossing Tabanovce. Mustafa was waiting for the first passenger composition and with it, without any documents and with only two tickets (he could not get more), to accommodate his family in a migrant train and at 8 pm they left for Tabanovce. We decided to drive to the Kumanovo border.